We have been getting beautiful heads of cabbage in our CSA boxes. This was a particularly huge and nice head of cabbage. My husband is not a fan of cooked cabbage in general and he also doesn't eat cole slaw. While I like both, this huge head of cabbage was more than I thought I could tackle on my own. Even I have my limits after all! So I decided to go on a mission and get creative in hopes that my husband and Little Dude would help me eat the cabbage before I had to leave town for work. I had seen a recipe title for cheesy cabbage somewhere and that got my wheels turning. I enjoy cabbage with Parmesan cheese on it, but that was the extent of my cabbage and cheese mingling experience. 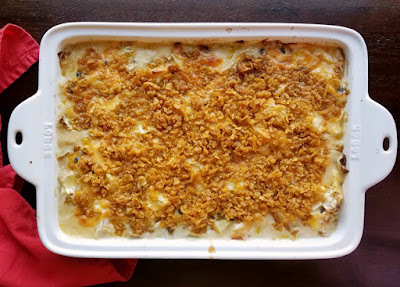 The idea of a cheesy cabbage seemed a little strange but also felt like it had potential. We are all big fans of cheese, so I thought if anything would get the guys to help me on this quest adding plenty of cheese would! 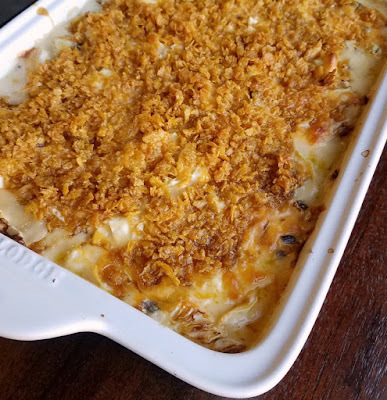 So I went to work making a cabbage version of the cheesy potato casserole. The first hurdle was shredding the cabbage. I figured getting it small would make eating it easier and I think I was right. Thinly slice it and then run your knife through it again the other way. That way you get nice tidy bites of cheesy cabbage goodness. You could certainly mix it all together in a bowl before putting it in a casserole. I chose to dirty one less bowl and just layer it in the baking dish. Cabbage cooks down so much and releases some liquid, so I figured it would all kind of come together in the end. When I first put the cheesy mixture over the cabbage I almost panicked. It didn't seem like it was going to be near enough. But I forged on anyway and as things cooked down, it really did come together as I had envisioned. My husband served himself up a big serving for dinner. I guess he didn't see any of the assembly and thought he was sitting down to a nice pile of cheesy potatoes. A bite or two in he realized that's not exactly what he had and recognized I tricked him into cabbage! He went ahead and ate it anyway even with the knowledge of it's true identity! Honestly he didn't race me to eat the leftovers, but that was fine. I really liked it and ate it for lunch most of the rest of the week! I think you should definitely give this recipe a go! Maybe you can convert a cabbage hater into a lover or maybe you will find a new favorite side dish. We have been still been getting great cabbage, both green and red. 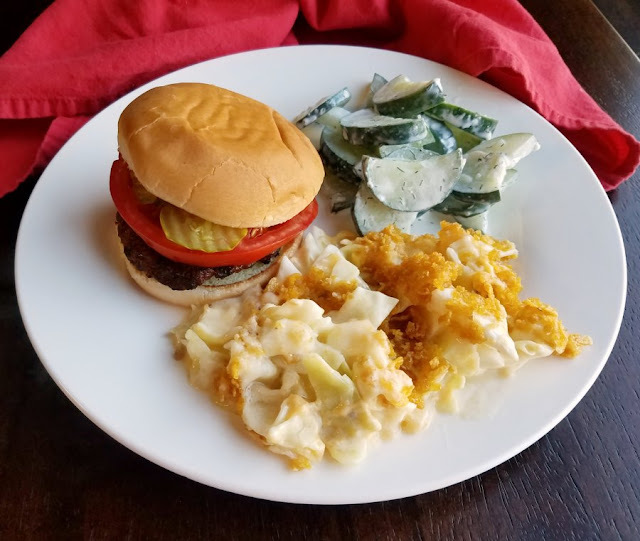 What are your favorite ways to eat cabbage? Preheat oven to 350 and spray a 9x13" pan with cooking spray. Clean and shred the head of cabbage and dice the onion. 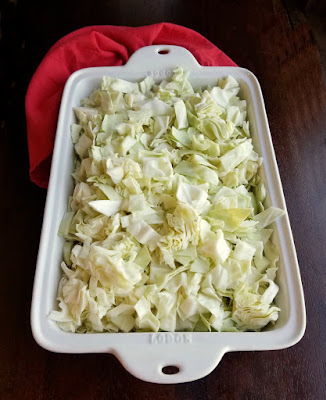 Place half of the cabbage in the bottom of the prepared dish. Distribute the onion over the top and then the remaining cabbage. Sprinkle with salt and pepper. In a bowl, mix together the cream of chicken, milk, sour cream and cheese. Pour evenly over the top of the cabbage. Bake for about 20 minutes. Then mix the corn flake crumbs with the butter and sprinkle over the top of the cabbage. Bake for another 30 minutes or until bubbly and the cabbage is cooked to your liking. Let rest for about 5-10 minutes and then serve. I lOVE cabbage so does my mom, she would love this. I will surprise her with one of Carlee's wonderful creations one day!! Oh my goodness, I hope you both love it! Every once in a while we can have a little breakthrough ;-) He also ate seconds of beets the other day, so there is hope after all! Oh my goodness, Carlee, this looks amazine! How many cups of cabbage would you guess you had? It was a really big head of cabbage, probably about 13 cups shredded. Though a little more or less should be fine. Oh My Gosh!!!! We are cabbage loving folks and this dish looks outstanding! Am ready to scooty poot :-) into the kitchen and whip up this dish. Was also thinking that some pre-cooked ground beef or other meat ( leftover pot roast/shredded beef or pork) could really turn this into some awesome comfort food. Genius idea!!!! Thank you sooooo much for sharing. Y'all have a super day! Adding pot roast or pork would make this an excellent one pot dinner! What a great idea! Now I can't wait to give it a go! This sounds right up our alley! Thankfully, we both eat cabbage. This is a new way to do it. Making this soon. Thanks. I can't wait to try this! It looks so good! Thanks for sharing at Merry Monday! I cannot stand cream of chicken soup! Think I will use cream of celery otherwise it sounds yummy! Cream of celery would be perfect and it would make it vegetarian friendly as well. What a great idea! 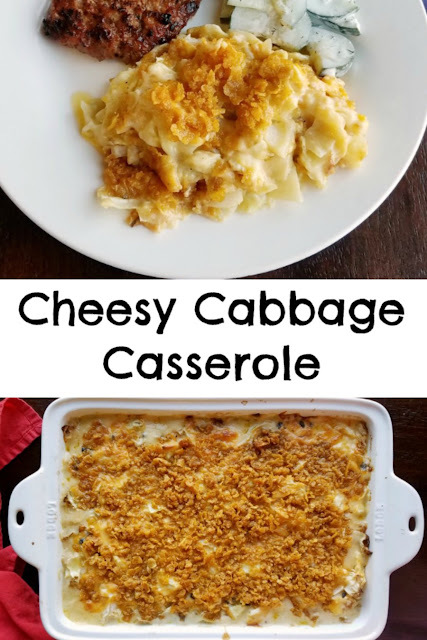 I love cabbage and had never heard of a cheesy cabbage casserole. I love that your husband started eating it thinking that it was something else. Hey we have to do whatever we can to get them to eat those veggies - right!?! This does sound intriguing and I want to try it. Sometimes you have to pull out all the tricks ;-) I hope you give it a go! 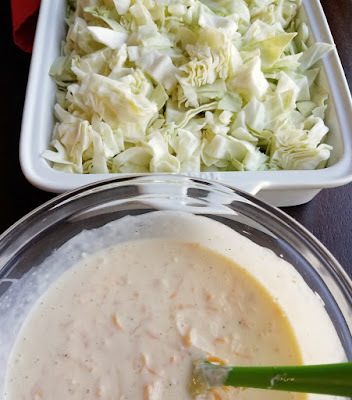 My husband likes cabbage raw like in salad. BUT he liked this. It was very good nice and creamy. YAY!!!! I am so glad you enjoyed it! WOW, Carlee, this looks amazing! Who wouldn't pile a huge helping of this on their plate? Thanks so much for sharing with us at the Whimsical Wednesdays Link Party! My husband if he would have asked what it was first ;-) Luckily he ate his whole heaping serving even after he realized it wasn't potatoes! 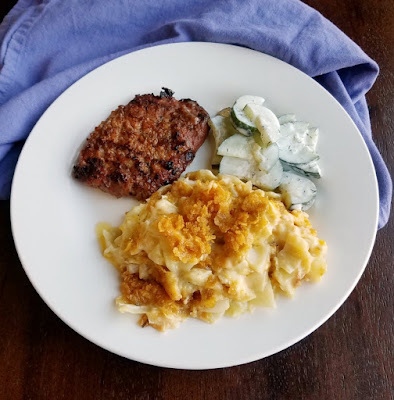 I can't wait to try your delicious Cheesy Cabbage Casserole! Hope you are having a great week and thanks so much for sharing with us at Full Plate Thursday! I hope you enjoy it, Miz Helen! Oh my...this one looks and sounds fantastic...I might need to make a jazzed up apple version of this soon!!! Oooh, that sounds good too!